Due to increasing interconnection and dependence on third parties, the overall security stance of a company increasingly relies on the security level of its providers and vendors. Managing and reducing risks resulting from your third party ecosystem is a growing challenge for organizations. Successful hacks and data breaches of the last months and years repeatedly have shown that this risk is regularly underrated. 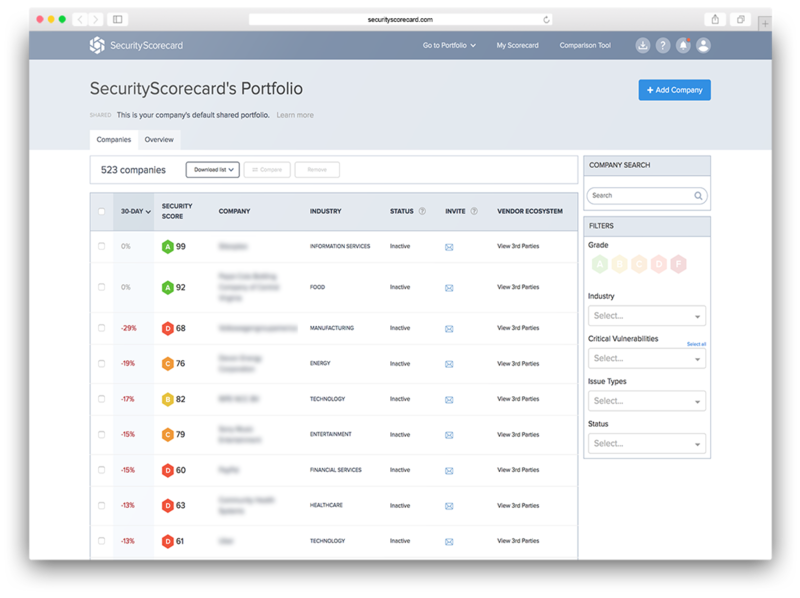 SecurityScorecard gives your company the tool to monitor and manage those risks in an easy-to-follow and accessible manner. SecurityScorecard enables users to view and continuously monitor security ratings, easily add vendors or partner organizations and report on the cyberhealth of your extended third party ecosystems. The platform automatically generates a recommended action plan for issue remediation in order to achieve a “target” letter grade for an enterprises’ vendor and partner organizations as well as your own company. It also provides access to breach insights and shows a clear record of issues that have affected scores over time. 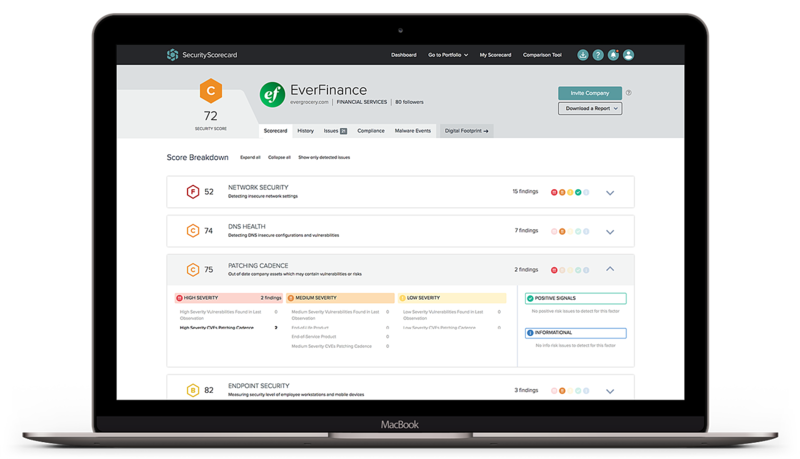 Furthermore, SecurityScorecard not only is helpful for monitoring IT-security risks, but also supports your organization to meet expectations regarding data protection, legal & compliance requirements as well as supporting audit functions. SecurityScorecard gives you a complete view of the security posture of your entire ecosystem. Its easy-to-use dashboard displays mission-critical information including high-risk vendors, critical and common security issues and predictive breach insights for your portfolios. Network Security - Examples of network security hacks include exploiting vulnerabilities such as open access points, insecure or misconfigured SSL certificates or database vulnerabilities and security holes that can stem from the lack of proper security measures. DNS Security - The platform measures multiple DNS configuration settings, such as OpenResolver configurations as well as the presence of recommended configurations such as DNSSEC, SPF, DKIM, and DMARC. Endpoint Security - Endpoint security refers to the protection involved regarding an organization’s laptops, desktops, mobile devices and all employee devices that access that company’s network. Web Application Security - Examples of vulnerabilities detected include injection attacks. Patching Cadence - How diligently a company is patching its operating systems, services, applications, software and hardware in a timely manner. IP Reputation - The system compares the company's IP addresses with suspicious or infected IP addresses and rates the IP reputation. Cubit Score - The Cubit Score factor is SecurityScorecard’s proprietary threat indicator that measures a collection of critical security and configuration issues related to exposed administrative portals. Hacker Chatter - The platform continuously collects communications from multiple streams of underground chatter, including hard-to-access or private hacker forums. Organizations and IPs that are discussed or targeted are identified. Leaked Credentials - SecurityScorecard identifies sensitive information that is exposed as result of a data breach or leak and is published on information repositories. Social Engineering - SecurityScorecard identifies a variety of factors related to social engineering, such as employees using their corporate account information for services, for example social networks, service accounts, personal finance accounts, and marketing lists that can be exploited. Score Planner provides full visibility and transparency into how specific security issues impact scores and automatically generates a recommended remediation plan in order to achieve a “target” letter grade. Once a plan is generated, you can download it as a CSV for convenient integration with your issue tracking system or GRC platform. In addition, the platform also allows the security level of a company to be measured against internationally accepted standards (ISO 27001/2, NIST CSF, PCI DSS, etc.) as well as regulatory requirements (e.g. GDPR). Management reports and detailed analysis reports can also be generated with just a few mouse clicks. Discover how hackers, partners, and customers see your organization from the outside. Successful cooperation with SecurityScorecard in Switzerland. InfoGuard can professionally support your organization in using the SecurityScorecard solution in order to evaluate your third party security risks. InfoGuard has a team of experts that support your organization in planning and implementing the necessary next steps in order to manage the identified risks professionally.